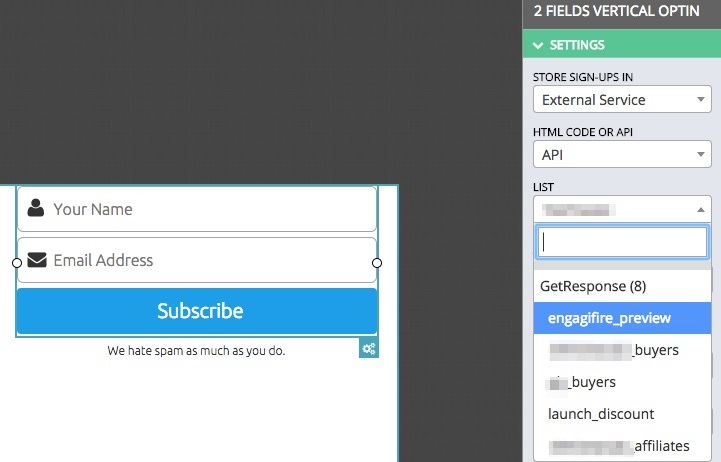 In order to link your autoresponder via the API , head to Settings > Integrations and click on the “New Integration” button. Click on the “Sync Lists” button to synchronize with you lists and campaign (if you use Aweber, you’ll need to click on the green “Connect” button before “Sync Lists”). Go to your opt-in settings by clicking on the little icon on the bottom right. Then select “External Service” for the “Store Sign-ups In” option. Then select “API” for the “HTML Code OR API” option. Then select the desired list from the option “List”. That’s all! now, all sign-ups will go directly to your list.